Furniture Has to be Moved. How do you think, which is the most common question received by our Moving Company in Guelph? If you’ve ever had to relocate to another area of the city or even to the next street, then you know how important is to move the furniture! If you had face this problem for the first time and thinking that you can handle it on your own, then let us convince you to stop and think twice. Before deciding to do it by yourself, make sure you’re aware of possible troubles and unpleasant consequences, like: damages to the furniture when moving on stairs, possible damages to the furniture inside the truck during the shipping. To avoid this, your furniture should be secured inside the vehicle by special strapping. And finally, even the vehicle itself, on which you move your stuff, is a subject to certain risks and some care measures. 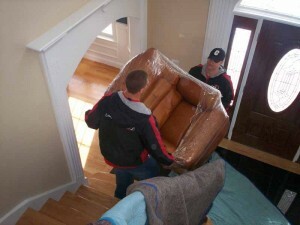 Make your life easier and entrust your furniture moving to Best Guelph Movers. Our staffs are experienced and professional. Our movers helped thousands of families with their various moving needs. In our company you’ll get competent packers, experienced drivers, physically prepared for any difficulties movers; our fleet consists of new trucks, which are in perfect technical condition and equipped with extra protection against shocks; in our company packing material are always available for extra protection of your furniture. You do not have to buy packaging supplies, since all these and even more our movers will bring with them. Interested? Then, find out all the details from our consultants, who are ready to answer any of your questions. No matter if you are a commercial customer or a residential customer, you will be treated as our biggest customer. You will receive a service that you will be proud to recommend. If you are looking for the Best Guelph moving service then look no further. With our experienced movers team and our affordable prices with excellent service, we are the Guelph movers to call.